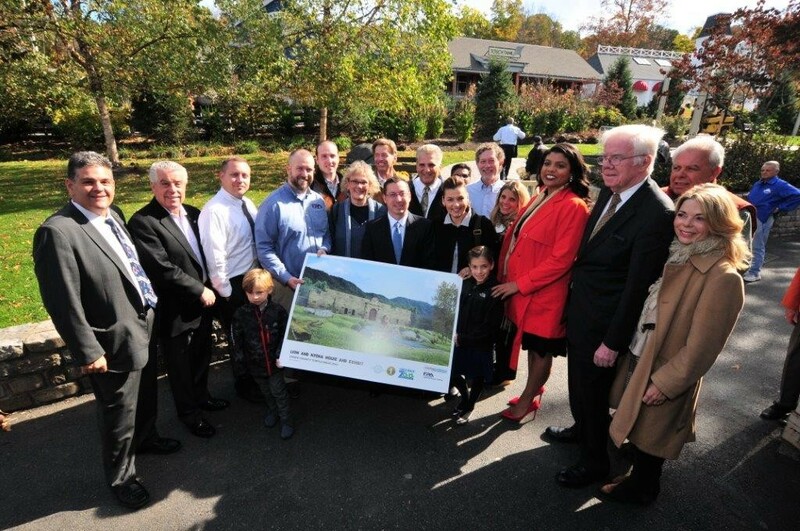 West Orange, NJ – Essex County Executive Joseph N. DiVincenzo, Jr. outlined plans to develop the Ronald J. Mount Lion and Hyena Exhibit at Essex County Turtle Back Zoo in West Orange on Wednesday, October 26th. The exhibit is named after the late Ronald J. Mount, who was a major supporter of the zoo and a member of the Zoological Society of New Jersey and the Volunteer Docent organization. In addition, the County Executive announced a new Condor Exhibit is being developed, enhancements to the Cattle Exhibit are being made, new fencing is being installed at the Essex Farm Petting Zoo and shade structures are being installed at the Sea Lion Sound Exhibit, amphitheater and Dinosaur Playground. “We are very excited about bringing lions and hyenas to Turtle Back Zoo because they are the animals that people most identify with the African Savanna. In addition, a lion is the central figure on our Essex County Seal, so we are pleased about bringing the real life version of our iconic seal here,” DiVincenzo said. “We are always looking for new ways to attract new visitors and enhance their experience. Bringing new animal exhibits, upgrading exhibits to improve viewing areas for the public and introducing amenities create new things for people see and learn about and makes their visits more enjoyable,” he added. “The exhibit is going to be an amazing addition to Turtle Back Zoo. I thank the County Executive and the Freeholders for the deep respect you’ve shown my father and my family,” said Mount’s son, Ian Mount. “When I think of Lions, I think about pride, and that reminds me of my father. I’m proud of him when I think of all the lives he has touched,” he added. The lion and hyena exhibit will be located in the African Adventure Exhibit adjacent to the Giraffe House. The half-acre exhibit will be heavily landscaped and have a two-foot pool and exposed rock formation. There will be three viewing stations for the public. Inside the exhibit near one of the viewing stations will be a heated stone patio to attract the lions so they can be easily seen by the public. At the rear of the exhibit will be a heated one-story building that is designed to resemble a North African fortress that has been returned to the wild. “This is the busiest attraction in New Jersey,” Sheriff Armando Fontoura said. “We are pleased to partner with the County Executive and the Freeholders to make it the safest in the state,” he added. “I have always had a great deal of respect for Ronald Mount because he gave so much back and the zoo was one of his pet projects,” Assemblyman Thomas Giblin said. “The addition of the Lion Exhibit really completes the zoo the way it should be,” he added. “I’m really excited about this exhibit. The lion is part of our seal and symbolic of our county. I can’t wait for its opening,” Freeholder President Britnee Timberlake said. “I am pleased that this exhibit is being named for Ronald Mount. As a Docent and member of the Zoological Society, he really cared about Turtle Back Zoo,” Freeholder Patricia Sebold said. “I commend County Executive DiVincenzo, because not only has he secured new exhibits for children and the public, but he has kept an eye out for the taxpayers and received grants and donations to build them,” Freeholder Leonard Luciano said. French and Parrello from Wall, NJ, received a $350,000 contract to design the exhibit. Shauger Property Services from East Orange was awarded a publicly bid contract for $3,660,214 to perform the construction work. The exhibit is being funded with a donation from Ian Mount, Ronald Mount’s son, and support from the Pooled Government Loan Program from the Essex County Improvement Authority. Construction started earlier this month and is schedule to be complete by the spring of 2017. “The addition of the lion exhibit and all the other improvements that are being done definitely will enhance our visitors’ experience when they come to Turtle Back Zoo and assist with our mission to promote conservation and educate the public about the importance of animals,” Essex County Turtle Back Zoo Director Brint Spencer said. “It’s exciting to see Turtle Back grow and expand. All of this is made possible because County Executive DiVincenzo’s vision and the resources he finds to bring them to reality,” he added. “Over the last five years, the zoo has grown immensely and become an incredible resource for families,” Zoological Society of New Jersey Executive Director Adam Kerins said. “Ronald Mount had an incredible impact on Turtle Back and associating his name with the exhibit in perpetuity is an incredible honor,” he added. The County Executive also noted that several other projects were being undertaken to create new or enhance existing animal exhibits, provide amenities to make visitors’ experiences more enjoyable and to modernize fencing. Condor Exhibit: A new Condor Exhibit is being constructed next to the Penguin Coast Exhibit. It will take the place of an older exhibit that was damaged several years ago after a storm. Construction started earlier in October is scheduled to be completed by the spring of 2017. French and Parrello received a $90,000 contract to design the exhibit. Zenith Construction Services from Orange was awarded a publicly bid contract for $1,038,777 to perform the construction work. The exhibit is being funded through the ECIA’s Pooled Government Loan Program. Scottish Highland Cattle and Wolf Woods Exhibit: The viewing areas at the Scottish Highland Cattle and Wolf Woods exhibits are being improved to provide the public with better opportunities to see the animals. At the Scottish Highland Cattle Exhibit, a new covered viewing area for the public is being constructed. The improvements include creating a patio area for the public to gather in front of the exhibit. Instead of looking through a fence into the exhibit, glass walls will be erected. A lattice covering will provide shade over the viewing area. The upgrades are similar to the work done earlier in 2016 to enhance the viewing area at the Bison Exhibit. At the Wolf Woods, the windows in the viewing area are being enlarged. The improvements were designed by French and Parrello. Zenith Construction was awarded a publicly bid contract for $461,876 to perform the construction work. Shade Structures: Shade structures are being installed over the Sea Lion Sound pool, the amphitheater and the children’s Dinosaur Playground. The shade structure over the Sea Lion exhibit will help regulate the water quality in the pool and, by keeping the water from direct sunlight, will help suppress the growth of algae in the water. The structure over the playground will keep the apparatus out of direct sunlight and prevent the climbing structures from getting too hot. The amphitheater structure will provide shade for people attending educational or entertainment programs. French and Parrello received a $48,000 contract to design the shade structures. Shauger Property Services was awarded a publicly bid contract for $281,550 to install the structures over the amphitheater and Sea Lion Sound; these are being funded with a grant from the Essex County Recreation and Open Space Trust Fund. Whirl Construction from Port Monmouth, N.J., received a publicly bid contract for $119,285 to install the structure over the playground; this is being funded through the Turtle Back Zoo Beautification Fund. Installation of Fencing: New perimeter fencing is being installed at the Zoo. National Fence Systems from Avenel was awarded a publicly bid contract for $297,250 to install the fence. It is being funded through the ECIA’s Pooled Government Loan Program. Essex County Turtle Back Zoo has roared back to life from the verge of closure by a previous administration. Attendance reached an all-time high of 755,239 in 2015 and the zoo has operated as a self-sustaining facility with revenue collected exceeding operating expenses for the last eight years. In addition, Turtle Back earned its third five-year accreditation from the Association of Zoos and Aquariums in 2016, a clear indication that an institution is committed to the highest standards in animal care, ethics, conservation and education. It also has been named the Best Zoo in New Jersey by NJ Monthly magazine four times and received a Certificate of Excellence from TripAdvisor.com the last three years. The Zoo is open seven days a week from 10 a.m. to 4:30 p.m. Admission is $14 for adults, $11 for children and senior citizens, and free for children younger than 2 years. For more information, call 973-731-5800 or visit www.essexcountynj.org/turtlebackzoo. Since taking office in 2003, DiVincenzo has spearheaded over $75 million in upgrades to Essex County Turtle Back Zoo, which have included developing the African Adventure with four Masai giraffes; a new Educational Building; the Carousel with 33 figures of endangered animals; the Sea Lion Sound Exhibit with sea lions, sharks and sting rays; the Big Cat Country Exhibit with jaguars and cougars; Tam-ring Gibbons Reserve with white cheeked gibbons apes, Reeves muntjac and white naped cranes; Australian Exhibit that features kangaroos, wallabies, emus and over 500 birds in the Aviary; Reptile and Education Center, open air dining pavilion and playground, Penguin Exhibit, Otter Exhibit, Wolf Exhibit, Alligator Exhibit, North American Animal Exhibit, Black Bear Exhibit, Animal Hospital, Essex Farm Petting Zoo and South American Animal Exhibit; renovating the Food Pavilion for year-round use and making upgrades to the entrance as well as fencing and infrastructure to meet AZA requirements. Funding has been provided through Green Acres grants, existing capital improvement bonds, or donations from the Zoological Society, Essex County Parks Foundation, corporations or private foundations. Corporations that have provided support include Investors Bank, Prudential Financial, Inc., Wells Fargo, PNC Bank, PSE&G, Verizon, Horizon Blue Cross Blue Shield of New Jersey, Coca Cola, Capital One Bank, TD Bank, Aramark, Covanta Energy, Matrix Development Group and OxyMagic carpet cleaning. The Essex County Park System was created in 1895 and is the first county park system established in the United States. The Park System consists of more than 6,000 acres and has 22 parks, five reservations, an environmental center, a zoo, Treetop Adventure Course, ice skating rink, roller skating rink, three public golf courses, golf driving range, two miniature golf courses, three off-leash dog facilities, a castle and the Presby Memorial Iris Gardens. Turtle Back Zoo is located in Essex County’s South Mountain Reservation and was opened to the public in 1963.